919 Spring Garden Street, now owned by Richard and Susan Stone, will no longer be divided into apartments. 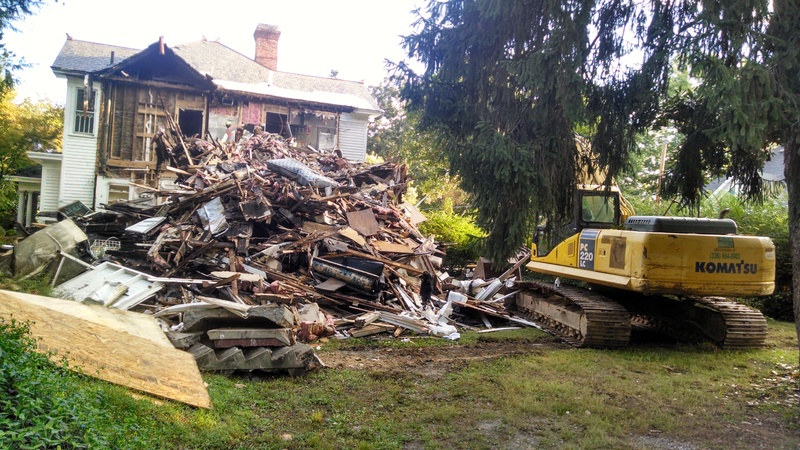 A prominent College Hill home has been saved, three years after a fire nearly led to its demolition. The sale of 919 Spring Garden Street closed on Monday. The buyers are Richard and Susan Stone. They will renovate it as their home; it had been divided into apartments for 50 years or more. Demolition of the fire-ravaged rear section of the home is already well under way. 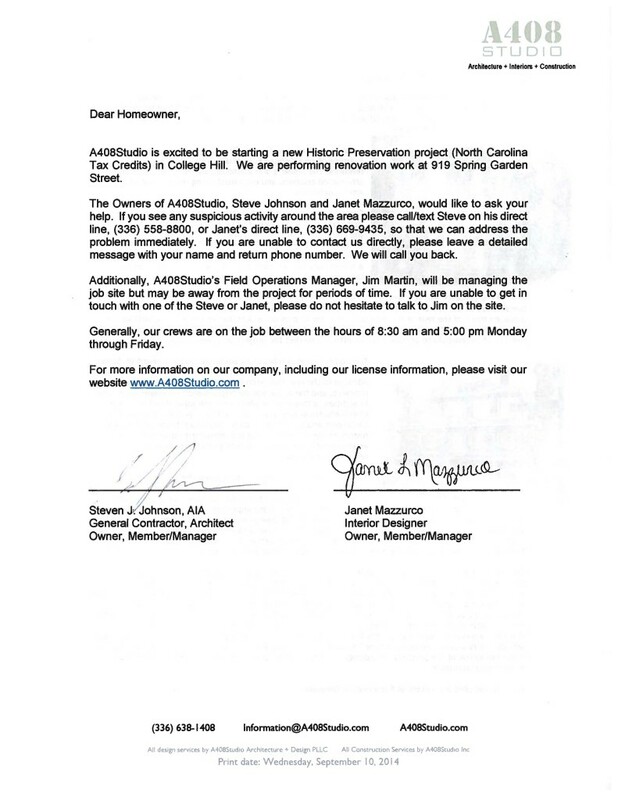 The Historic Preservation Commission signed off on the project before the sale closed. Click here for details on the house and the renovation (PDF). The house is located at the corner of Spring Garden and Joyner Street, one block from UNCG. 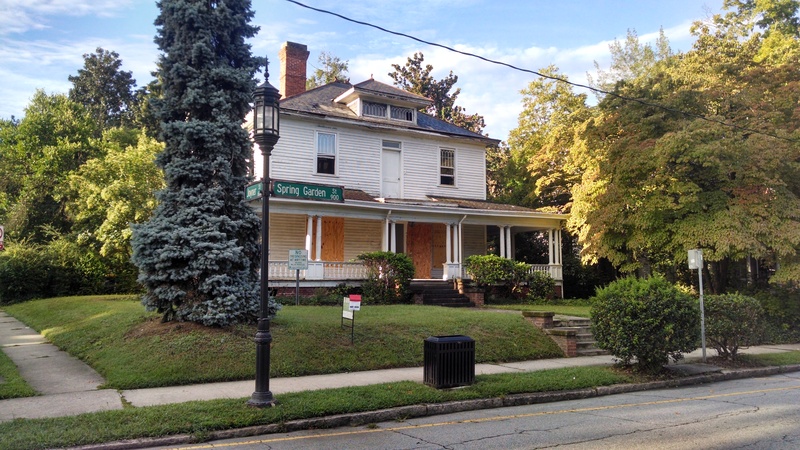 The 1907 home was saved by an unprecedented collaboration led by the City of Greensboro, Preservation Greensboro and the College Hill Neighborhood Association. The home’s previous owner, College Place United Methodist Church, had planned to tear it down if a buyer couldn’t be found, but graciously extended its deadline and its patience to allow time for the rescue effort to be completed. Saving the house required amending the city’s rules on Municipal Service District funds, the special tax paid by property owners in the College Hill Historic District. The change allows MSD funds to be used to buy historic-district properties such as this one for renovation. City Council member Zack Matheny and Mayor Nancy Vaughan were instrumental in winning City Council approval for the change. With $25,000 in MSD funds and $25,000 from the Greensboro Redevelopment Commission, the city bought the house from the church and turned it over to Preservation Greensboro to sell. Finding a buyer with the requisite resources and interest in preservation was no small feat. The Stones have rewarded everyone’s work and patience with their vision and commitment to restoring the home. A large group of people and organizations made this effort successful — Matheny and Vaughan, Dawn Cheney and her colleagues on the Greensboro Redevelopment Commission, Mike Cowhig and Stefan-Leih Geary of the Historic District Program, Benjamin Briggs of Preservation Greensboro, Marsh Prause of the Preservation Greensboro Development Fund, the Rev. Dr. Jason Harvey and College Place UMC, Steve Johnson of A408 Studio (architect and contractor), Ann Bowers and the Historic Preservation Commission, James Keith and the College Hill Neighborhood Association, and the State Historic Preservation Office all made essential contributions. And especially Richard and Susan Stone. Like everyone else, they’ve done a great amount of work to secure the future of their home. Unlike everyone else, they still have much work ahead of them. We welcome them to the neighborhood and look forward to having them as neighbors. This entry was posted in City Government, Historic Preservation, Municipal Service District, Real Estate, Spring Garden Street and tagged Preservation Greensboro. Bookmark the permalink.